This fall our colleague Meghan Carey, Art Director for Vera Wang Fine Papers, had the opportunity to visit Winslow Homer’s Studio at Prout’s Neck, a beautiful peninsula overlooking Maine’s Casco Bay. Winslow Homer’s family had substantial real estate holdings at Prout's Neck, so the artist retired there in 1883. Known as a recluse and curmudgeon, he lived austerely and became deeply immersed in the dramatic textures of the land and sea around him. It was in this studio that he devoted the remainder of his life to painting the monumental sea scenes for which he's most famous. 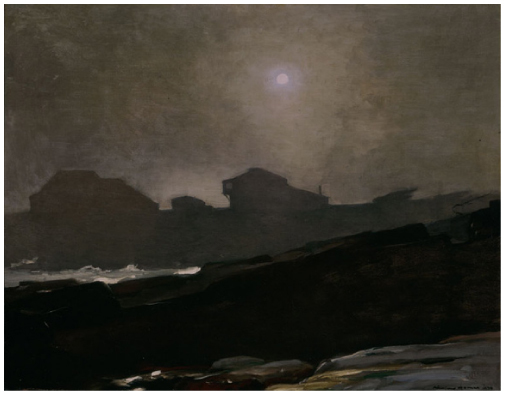 Art historians often note how Maine's rugged coast matured and transformed Homer's work, elevating him to a singular place among American artists. Left: Meghan's photo of the shoreline. Right: Her Instagram from Homer's living room. After a multi-year renovation, the Portland Museum of Art opened the studio museum in September to coincide with its Winslow Homer Exhibit currently on display at its flagship museum in Portland through December 30, 2012.